Adrenaline, fun, sun, water, flumes, surfing… There are a thousand of reasons to come to Aquópolis with your friends. Do you want to suggest an unforgettable plan? Come and you’ll not be disappointed. If you want a family meal, under a cool shade, use our barbecue terrace, which offers various combination plates and grilled meats. Come and enjoy our Menu of Hamburgers, Hot Dogs, pizzas and with the tastiest Fries and Nuggets in the whole Park. Experts in the manufacture of crêpes with an extremely fine hot chocolate. To relax far from the madding crowd, you can feel like a special person in the VIP area of Aquópolis. Hire a sunbed for those moments of calm, peace, relaxation and tranquillity. To enjoy the attractions properly without fear of losing anything or being broken, leave them in a safe and well-located place. – Follow the motorway A-49 towards Huelva, take the exit towards Ayamonte-Portugal and then towards Cartaya-Este-Playas. – Take the motorway from Lisbon to Spain and get to Ayamonte, follow the motorway A-49 and take the exit Cartaya-Este-Playas. – DAMAS buses (Check Schedule and rates: 959256900). 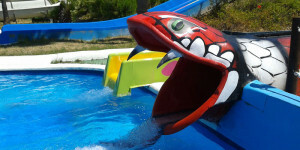 – If you are in Huelva we suggest you buy the ticket to Aquópolis Cartaya. – If you are in Ayamonte, come to Aquópolis Cartaya taking the line that goes to Huelva by the coast.